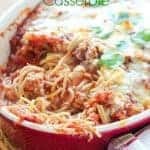 This Baked Spaghetti Casserole will quickly become a family favorite! We love how it is made with simple ingredients and feeds a crowd! In large skillet brown ground meat. Drain excess fat. Remove from skillet and set aside. In same skillet, add olive oil, chopped onions and garlic. Saute until onions are soft. Add crushed tomatoes, oregano, salt and pepper to taste. Cover the bottom of the dish with 1/3 of the meat sauce. Top with half the pasta and 1/2 cup of cheese. Repeat layers ending in sauce. Top with remaining cheese. Bake for 30-40 minutes until warmed through and bubbly!